On Monday May 9th, 2016 the planet Mercury will come between the Earth & the Sun, so we will be able to see Mercury transiting (crossing) the disc of the Sun using special telescopes. California will be able to see most of the event in 2016; the next Mercury transits will take place until the years 2019 and 2049. UC Riverside is hosting an all day event! 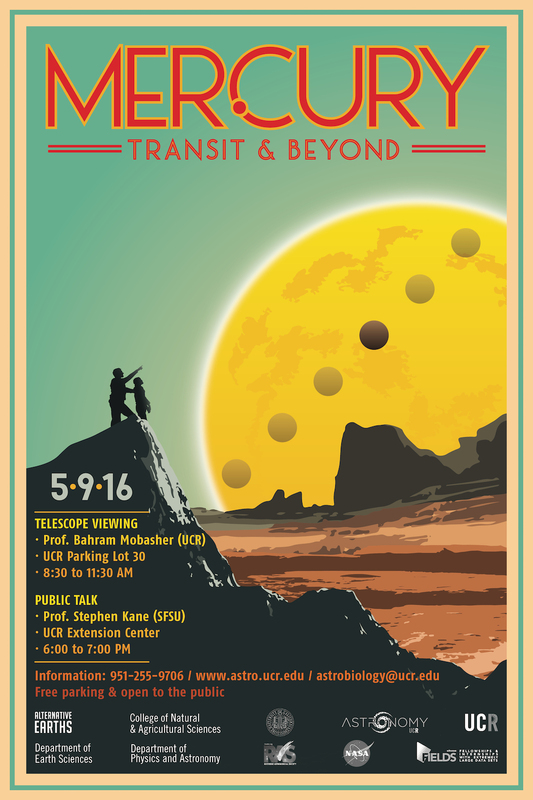 So take 15 minutes of your time and come see this event of a lifetime through our telescopes and then come back in the afternoon for a special talk! The Physics and Astronomy department of UCR and the Riverside Astronomical Society will provide special telescopes to safely see Mercury transiting the solar disc. Lines are expected to be short, so come on down and take 5 minutes to see Mercury. Parking is free ! The transit will have started when the sun rises over the horizon and will finish at 11:46 AM. You can see a simulation of how it will look in Riverside. Transit as seen from Riverside. (subtract 7 hours for Pacific Daylight). Stephen Kane has been researching planets around other stars for more than 20 years and has discovered and characterized hundreds of exoplanets, including Kepler-186f which is the smallest planet yet to have been found in the Habitable Zone of a star. After spending many years working at the NASA Exoplanet Science Institute, Kane is now a Professor of Astrophysics at San Francisco State University (SFSU). He is the Chair of the Kepler Habitable Zone Working Group and the Director of the Planetary Research Laboratory at SFSU. Mercury Transit as captured by NASA in 2006. This event is made possible thanks to the support of the Alternative Earths Program, UCR’s Chancellor’s Office, the CNAS Dean’s Office, the Department of Physics and Astronomy, the Department of Earth Sciences, the Riverside Astronomical Society, the FIELDS Program, NASA and UC Riverside campus.